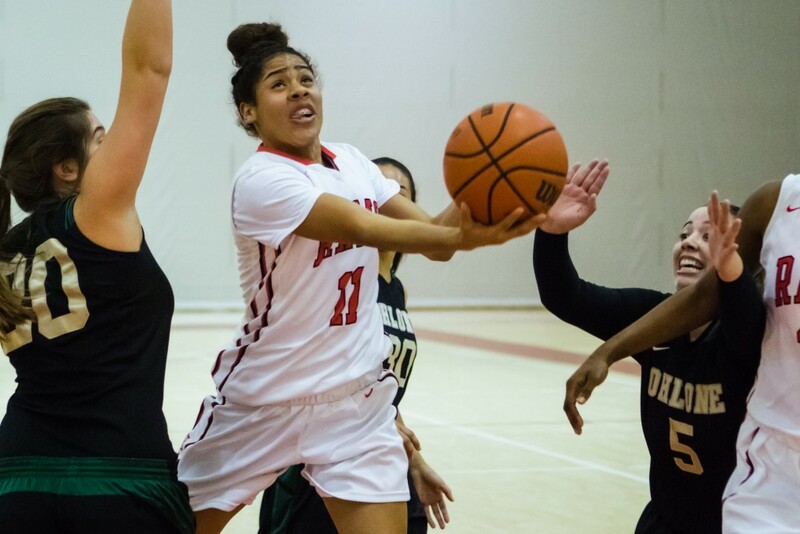 Last Wednesday evening the lady Rams basketball team dominated over the Ohlone Renegades, executing a strong passing game to wear down their opponents for a 96-44 victory. The Rams won the tipoff and wasted no time. Freshman point guard Gabrielle Vigil opened scoring with the first three points of the game, with her teammates right behind keeping up the pace to reach an 11-0 lead early in the first quarter. The Renegades were not far behind ending the first quarter 18-11, but quickly fell behind during the second quarter with no scoring until 5 minutes in—landing only a one-point gain after two free throws by Renegades point guard Nicole Machado‐Potestio. The Renegades’ chance to catch up looked slim towards the end of the second when the Rams widened the lead to 40-21. Over the entire match, the Rams completed multiple strong 3 point scoring plays, something assistant coach Monique Calvello says they have been working on in particular. Freshman guard Brittney Deckman was fluid in her plays and led the team’s three-point scoring with five. “We have good teamwork, so we don’t have to try that hard because everyone knows what they’re doing,” Deckman said. Calvello says Deckman, along with her twin sister Brianna, and fellow freshman Gabrielle Vigil, were the most valuable players the game. “This was the first game they really got to showcase all their skills, both offense and defense, and that was exciting to watch,” Calvello said. Vigil also has the sixth best scoring record in the state—a title very deserving for the freshman point guard who led scoring with 22 points this game. The Renegades scoring stagnated in the third quarter, landing only 10 points while the Rams tripled that with 30 points, ending the quarter at 70-32. However that was not an issue this game as the girls kept the momentum through the fourth quarter to gain 26 more points. The Rams are ranked second in the state for women’s basketball, and their 96-44 victory solidifies that status. The next game will be against City College’s rival Skyline College on January 29th at 5 p.m. at home court in the Rams gymnasium.